Archaeologists are trying to piece together clues to the identity of a shipwreck in the north-west Highlands. 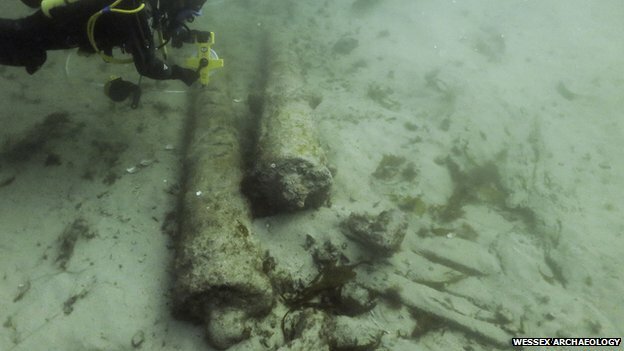 Three cannon and part of a wooden hull lie on the seabed near Drumbeg in Sutherland. Archaeologists believe it could be the remains of a Dutch vessel that got into difficulty between 1650 and 1750. The site was given emergency protected status on 18 March this year, but the Scottish government has proposed giving it a more permanent designation. Local scallop divers have known of the wreck site in Eddrachillis Bay since the 1990s, but only recently have archaeologists been able to make a proper assessment of it. Archaeologists from WA Coastal and Marine examined the wreck last year on behalf of Historic Scotland. It was confirmed to be of national historical importance and is now one of seven Scottish shipwreck sites proposed for the government's new Historic Marine Protected Area status. WA Coastal and Marine, an educational charity, used a diver-based imaging technique to create 3D models of the site and the three cannon. The models are being used in the effort to better understand the wreck's story. Archaeologists said that the accuracy of the models allowed for the measuring and analysing of the remains on dry land. They have already been able to establish more accurate measurements of the cannon. This has helped to match them to other cannons which in turn could reveal important details about the ship and its crew. A historical record of the shipwreck has still to be found. However, the cannons and a number of artefacts recovered from the site, including cannonballs and a piece of decorated tile, provide some clues to the vessel and its crew. Charles Trollope, an independent cannon specialist, has identified the cannons as being of a type cast in Sweden for use by the Dutch. The weapons could have been used by the Drumbeg ship's crew to ward off privateers, privately-owned armed vessels commissioned by a state to attack an enemy's shipping. Today, the cannon are heavily encrusted and colonised by small red seaweeds. 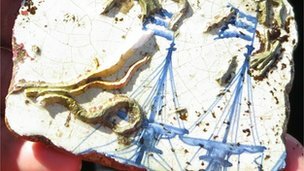 Also recovered from the wreck was a broken Delft tile decorated with an image of a three-masted ship flying the Dutch flag. Delft is a blue and white pottery made in the Netherlands. One theory is that the vessel was owned by the Dutch East India Company, also known as VOC. Founded in 1602, it was the world's biggest and most powerful trading company until it collapsed in financial ruin in 1799. Its vessels regularly sailed around the north of Scotland because of the favourable winds and also to avoid the English Channel, particularly at times of war and tensions in Europe. The wrecking of VOC vessels in Shetland was recorded by the Dutch company, and centuries later the shipwrecks were located by divers. One reported loss in Scotland outside the Shetland Islands, and which has still to be found, was the Trompetteer. It was seized and then burned by French sailors off the Scottish coast in 1692. Some or all of the crew of the Drumbeg ship may have survived their ordeal, archaeologists have suggested. There is possible evidence of foreign sailors setting up home in the north-west Highlands after their ships foundered off the Scottish coast. The First Statistical Account of Scotland published between 1791 and 1799 records how the climate of the area was pleasant enough for "natives of the East and West Indies" to live there. Philip Robertson, a Historic Scotland marine archaeologist, said the origins of the Drumbeg crew was still unknown. But he added: "The wreck gives us a unique window into our history and, interestingly, the trading activity off the Scottish coastline and across the world." Dr Jonathan Benjamin, of WA Coastal and Marine and the University of Edinburgh, said Scotland was a maritime nation with a rich seafaring history. He added: "However, there are only a handful of underwater archaeological sites around Scotland's coasts that are over 200 years old. "The wooden shipwreck at Drumbeg has remained on the seabed for three to four hundred years before it was discovered by a local diver and reported to Historic Scotland. 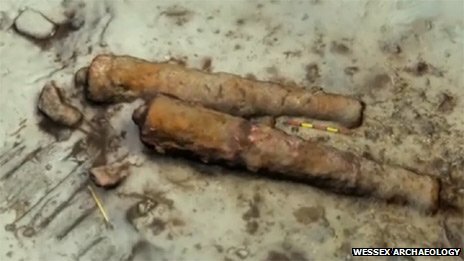 "This is an exciting and significant discovery. This site demonstrates the value of collaboration between archaeologists, local community members and divers to enhance our knowledge of underwater cultural heritage in Scotland." John McCarthy, also of WA Coastal and Marine, added: "We have conducted a lot of research on new methods of underwater digital survey and the survey at Drumbeg gave us the perfect opportunity to apply this new technology to an entire wreck site for the first time, and with fantastic results."